This guide shows how adjacency bonus works in NMS as of early Next. Basic Starting Guide (Next Update). A Dirt Farmer's Guide to Making Billions (Next Update). Flowchart Visual Guide for Refinery (Next Update). Yes, there is an adjacency bonus in Next. Place up to 3 upgrades for the same item either in a line or a wedge (diagonals don't count) and get a +4.6% bonus or two items, or a 6.8% bonus for three. 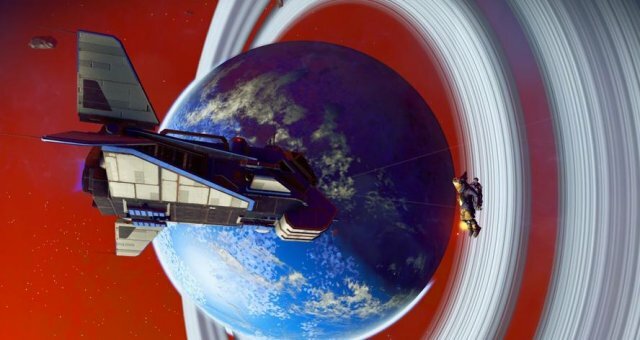 There is a lot of misinformation here and other forums as to how upgrades and bonuses work in Next. 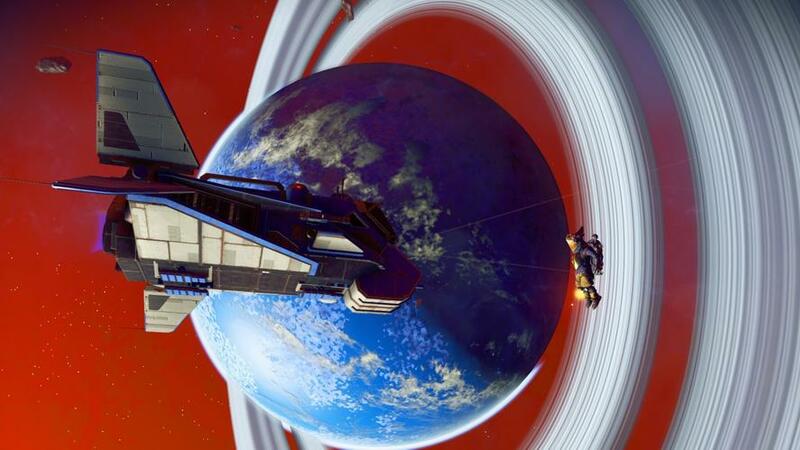 Some are linking the pre-Next guides, where people used to fill their whole inventory with upgrades and it all worked. In Next, most has changed. Before I present the visual aids, here are some general observations. The information below is current as of the Next update 1.53. It can probably change at any time. 1. You can install upgrades either in the Technology tab or the General inventory. Items obviously can't go into Tech, so you decide. 2. You can buy S-class upgrades at space stations. Vendor inventories will vary at each station but seem to be fixed per station. In their infinite wisdom, HG has decided to only have one S-class of each upgrade per vendor. You can either teleport between stations or do the sensible thing, buy one, enter your ship to save, reload that save and voila, another one available. 3. 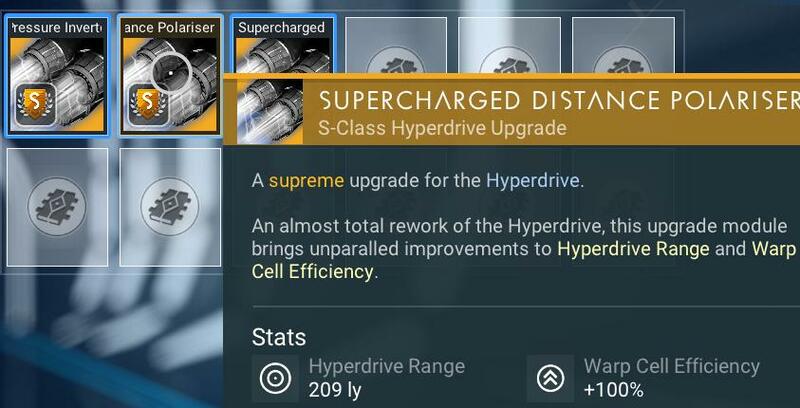 Before Next people could use more than 3 upgrades. In Next, the fourth will disable all upgrades for the same item. Not just the bonus but all the benefits of having any upgrades at all. 4. The game interface shows very little information as to the effectiveness of all your equipment and upgrades. The only figure that I could work with is the warp distance. It is shown in Light Years (LY) in the ship interface, and changes with each upgrade, and even, wait for it, shows bonuses. Examining the upgrades itself will not show any bonus in the item stats tooltip. Also, I am not shooting 10000 sentinels with a Boltcaster to see if there is a bonus or not. I will do my tests with the warp distance and assume that it is universal. While we are at it, 2.6% of what FFS? Anyway, I end up with 3 different items, different names and stats, with 2.6% is nowhere to be seen. On to the actual testing. 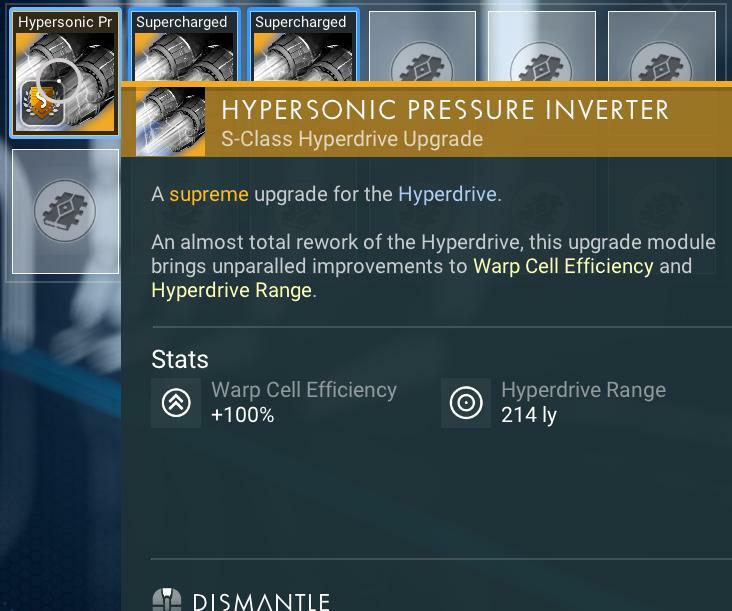 The testing was done using warp module upgrades on an S-Class fighter with 12 tech slots. It has a 100.0 LY range with no upgrades, which makes it easy to see what's what. Wow, we added 214 to the base 100, the game shows 313.6, close enough. 100 + 214 + 209 = 523, the game showing 522.2 is close enough. Here we get 547.5 LY, which is about +4.6% for adjacency. 727.5, just the simple sum of the 3 LY extensions. Also, diagonal does not give bonuses. Yay! 777.6, e.g. a +6.8% bonus. Oh noes, we broke it. A fourth upgrade will deactivate them all, we are back to 100 LY. I think I'd like to thank HG for doing that. If they hadn't put a limit on it, the little min-maxer sitting on my shoulder would have eaten most of my inventory with upgrades, then the pack rat sitting on the other would constantly b*ch and moan about lack of inventory space. Now, another thing. Minor, but needs mentioning. The value does not depend on the item I have purchased. Whether I place the first, second or third first, I will have +214 LY. The value does not depend on where I place the upgrade, any of the three placed placed in any of the lots will give +214 LY. The value is not decreasing with each item. After 214, 209 and 205 the fourth was 218. The only logical explanation is that there is a seed that will slightly randomize the upgrade values, so in my case the first I use will be +214 LY, then it will be 209 and so on, regardless of anything else. I am not spending more time figuring out if there is a seed per upgrade path or a single one for all upgrades or something else entirely. I just figured for myself that, unless I have unlimited nanites, there is no point in reloading and to try and buy or place in some particular order to get max benefit. I have placed the first one in the middle, then the others to each side, giving me 209-214-205. The result is slightly different, 777.9 vs 777.6. So just like pre-Next, the one in the middle got more bonus than the others. But for +0.04% I personally wouldn't bother.